In August of 2013, I received an email from a gentleman in Italy named Adriano. Adriano was interested in building a 23' center console from cold molded wood. At first I thought he just wanted to build a boat for himself. It was later that I found that he was actually starting a boat company in Puducherry, India on the Bay of Bengal. It seems there may be some good sport fishing opportunities there based on what the commercial boats catch, so Adriano thinks he may be able to sell some pleasure boats as the economy there is starting to grow and the people are starting to prosper. I was supposed to have the plans ready in just a few months, then the Myeloma came back. Adding to the delay was the project being more complex than I had originally planned. The Kitty Hawk 23 is based on the Bogue Sound 23 from a number of years ago. I thought I was half way there and could just finish up the existing drawings. Things didn't work out that way though. I decided I needed to make a small change to the bottom, add a bit more deadrise up forward. Well that meant the stringers and frames needed to be changed. There never was a deck drawing or console. The fuel tank had to be larger. In the end, other than the topsides of the hull, every other drawing had to be re-done. As mentioned above, the Kitty Hawk 23 is the same basic hull as the Bogue Sound 23, with a little more deadrise. Typical of the Carolina style hulls, she has lots of flare up forward that turns into tumblehome back aft. The midship sections have the traditional "S" shape, particularly in the area of the sheer break. She will use external spray rails like on the other Kitty Hawk designs in order to simplify construction. I have drawn some integral chine flats for the Indian boats, I may make that drawing available to those who want to make things more challenging! Her deck arrangement is a departure from the earlier Kitty Hawk designs. Instead of a raised casting deck up forward, the Kitty Hawk 23 features bow seating like on all the new production center consoles. The cockpit sole goes all the way to the anchor locker bulkhead at the bow, with the seating built on top. As the sole is well above the waterline, I figure these boxes can easily be drained overboard and used as fish boxes. In the sole between the seats there are two large storage areas that would be best used as general storage. The console is the same as the one on the Kitty Hawk 26, so there is room below for a head. Aft of the console, you can mount a leaning post with a baitwell or storage for a cooler. All the way aft, just forward of the motor well, there is another access hatch for machinery and storage. Construction is similar to the other Kitty Hawk designs. Her framing and bottom stringers are 3/4"(18mm) marine plywood. The topside stringers will be douglas fir or mahogany, as will the chine logs, clamps and keel. She will be built over a framework made up of both temporary and permanent frames. Topside planking will be either 2 layers of 6mm or 3 layers of 4mm okoume marine plywood. Her bottom consists of either 2 layers of 3/8" douglas fir or 2 layers of 9mm okoume marine plywood. If it makes life easier, you can plank the bottom with 3 layers of 6mm okoume. After planking she gets a layer of 1208 double bias (0/90) fiberglass set in epoxy before fairing and painting. Her interior should be coated with 2-3 coats of epoxy to seal the wood. Typical for my designs, her transom is rather overbuilt with three layers of 18mm okoume or 3/4" douglas fir if you want to save some money. All three layers go all the way across and tie in with the side planking. All the stringers tie into the transom and the cockpit sole is glassed to the transom all the way across. Needless to say, I don't think it's going anywhere! Her fuel tank sits just aft of the console and holds 117 gallons. The export version holds 454 liters. The tank is aluminum and the entire fuel system is designed to meet the latest standards. Boats built outside the US will have a different system that is similar to what we used to have here. As is my custom, the tank has welded on mounting brackets so it can be fastened directly to the stringers and frames. The tank can be easily serviced as there is a soft patch in the sole that is larger than the tank. The batteries will go up forward under the console, along with the battery charger. There are bilge pumps fore and aft, both of which are readily accessible. Wash down pumps and bait well pumps will be located by the builders, depending on what systems they choose. I suggest they go beneath the aftermost hatch in the sole as that should be a pretty roomy space. Power will come from a single outboard mounted directly to the transom, no more than a 300 hp V-6. I fear the weight of a V-8 will cause to much trim disturbance. People are always asking if they can build the boats with a bracket. I am not a fan of brackets as I don't like what they do to the trim of the vessel. That said, I am considering bracket versions of both the Kitty Hawk 23 and the Kitty Hawk 26. I need to do some math and see how bad the boats will be out of trim before I give it my blessing. I don't like brackets and don't recommend them for boats under 25', but I seem to be in the minority. Watch this space for future developments. The Kitty Hawk 23 is available as both a Plan Set with full size frame patterns or as a CNC cut Frame Kit. The Plan Set includes around 20 pages of drawings and the patterns printed on plastic film to ensure accuracy. The patterns were created from the CNC cut files and are a bit complex as they include all the cut-outs for the stringers, chines and clamp. A strongback drawing is included. The stem is laminated over a mold and this mold is included in the patterns. The plans have been drawn with dual dimensioning, so are ready for those of you outside the US. The CNC cut Frame Kit includes both the permanent and temporary frames, longitudinal bottom stringers, the 3 layer transom and the strongback. There is also a pre-cut form for laminating the stem to the correct shape. The Frame Kit includes most of the drawings from the Plan Set detailing her construction, including hull and deck details and a machinery arrangement. At some point in the future, Adriano and I would like to offer complete Kitty Hawk 23's and maybe even Kitty Hawk 26's through his company BNT Marine Craft. Once the first boats are built in India, we will have a better feel for costs and be better prepared to take orders. As it stands, Adriano has quite a few prospects and contacts who are interested in either buying boats or marketing them. This could be a very exciting development. 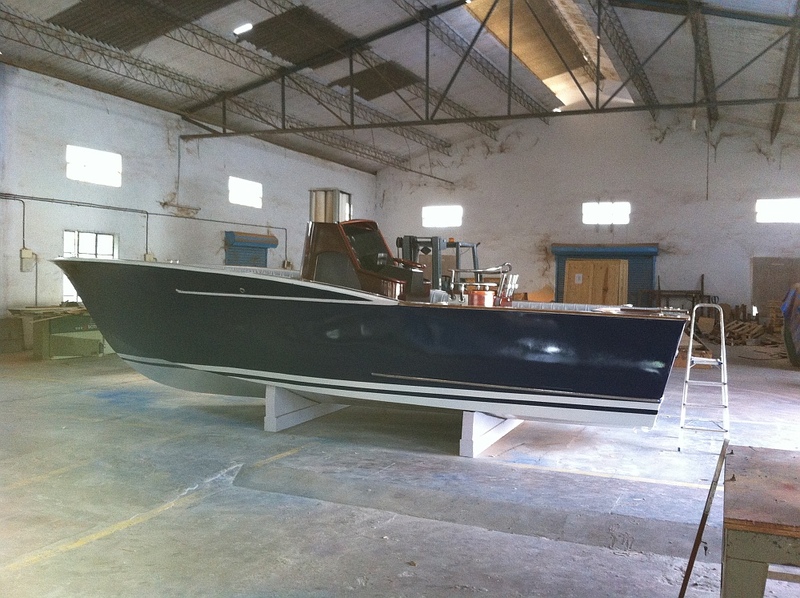 Carolina style boats designed in Florida, being built in India by an Italian! Such a small world we live in these days! To see photos of a Kitty Hawk 23 under construction, please visit the Underway page. 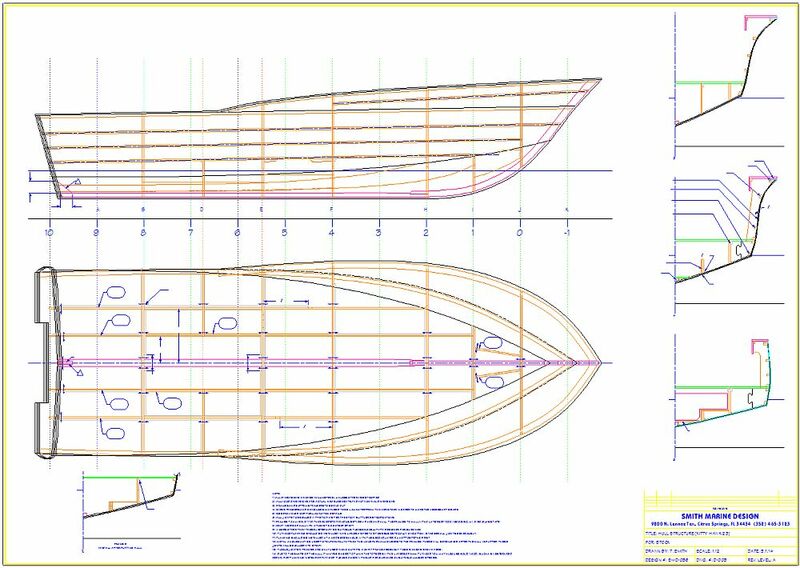 I have had many requests over the years for the Bogue Sound 23 plans. The Kitty Hawk 23 is that plan set. So if you have wanted a Kitty Hawk but the 26 was too big and the 18 a bit too small, maybe the 23 will be just right! If you are in the Continental U.S. and would like to order the Plan Set, you can use the online ordering system below. The cost is $500.00 plus $30.00 shipping in the continental U.S. If you are in Alaska, Hawaii, outside the U.S. or would like to pay by check or money order, please contact me. As costs for cutting the kits is constantly changing due to material and labor costs, I can not offer the kits at a fixed price. If you are interested in the CNC cut Frame Kit, please contact me and I will get you an up to date quote including the shipping charges and any applicable taxes.